Gaming has always been a social event. Whether playing the classic split screen on the SNES or large multiplayer games over the internet, gaming has reinforced the idea that it's meant to be enjoyed with others; this latest situation has shown the ideology is here to stay. 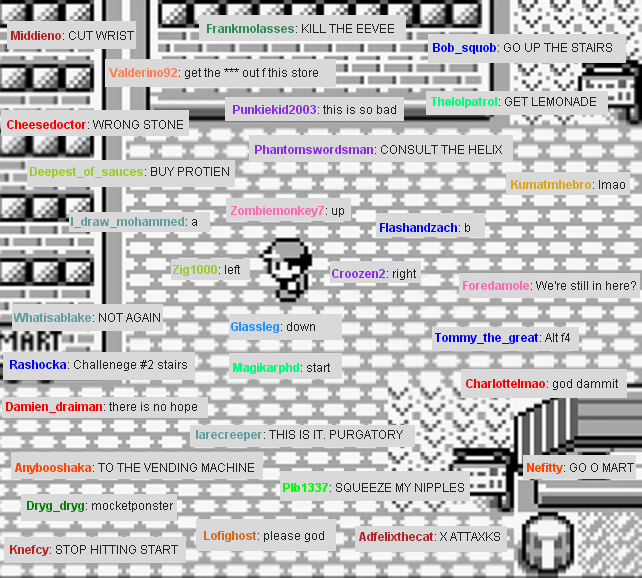 TwitchPlaysPokémon is a Twitch.tv channel that has captivated the internet this past weekend. 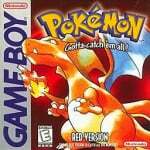 The channel launched a social experiment stream by playing Pokémon Red through an emulator. However, a unique twist was added. The game is in fact controlled by the channel’s chat — using an IRC (Internet Relay Chat) bot, the game is played based on the commands of the viewers. Users can enter the basic Game Boy commands (Up, Down, Left, Right, A, B, Start, Select) into the chat feed and control Red on the screen. However, due to the popularity of the stream an input lag of nearly 30 seconds occurs before you command is applied. At the time of writing the stream has been going for more than four days and sixteen hours and over 60,000 viewers are currently watching and/or participating. So far, the group has been able to conquer the first four gyms and is en route to the Team Rocket Headquarters. The current team consists of an Oddish, Rattata, Flareon, Drowzee, and Farfetch’d. Due to the surge of interest, the stream has overtaken swathes of the internet gaming community. Various memes have arisen due to the nature of the event and some of the hardships that come with such a large group. The process of teaching a Pokémon cut and getting to Erika’s gym took hours. The Helix Fossil has become the icon for the series, as it is one of the few remaining items in the trainer’s possession. As the image above shows, some funny moments have arisen from the stream. Hopefully this experiment will allow for similar events in the future. Although not much progress has been made compared to the time elapsed, it is an enjoyable experience for viewers none the less. Have you been watching the stream? Are you enjoying it? Let us know in the comments. In the particular case of this writer the stream has been playing constantly on in the background, awaiting the next funny or productive moment. To check out the stream, follow the link below. Also, a link to a regularly updated page containing the current status of the playthrough can also be found. How does that even work? Tens of thousands of people having input of one game at once?! It's a wonder the thing hasn't just crashed or something! Its incredibly annoying, like sharing a controller with a little brother but that little brother is 3 million internet trolls. The birth of so many ace memes. @Nibelilt Ok, that's probably the funniest picture I've seen about this stream. And I've thought I'd seen most of the insane stuff the internet has to offer. This is mind boggling. I would join in just for the giggles but just watching the action for too long gives me a headache. @Philip_J_Reed Now THAT I'd stay up an entire week to see. Under the power of the Helix Fossil we will become the POKEMON MASTER!!!! Sounds pretty cool, but I bet people could totally screw each other over. Is this what it's like to be a part of a hive mind? Time to prove/disprove the infinite monkey theory! @Drake That has to be the best gif I've seen yet! 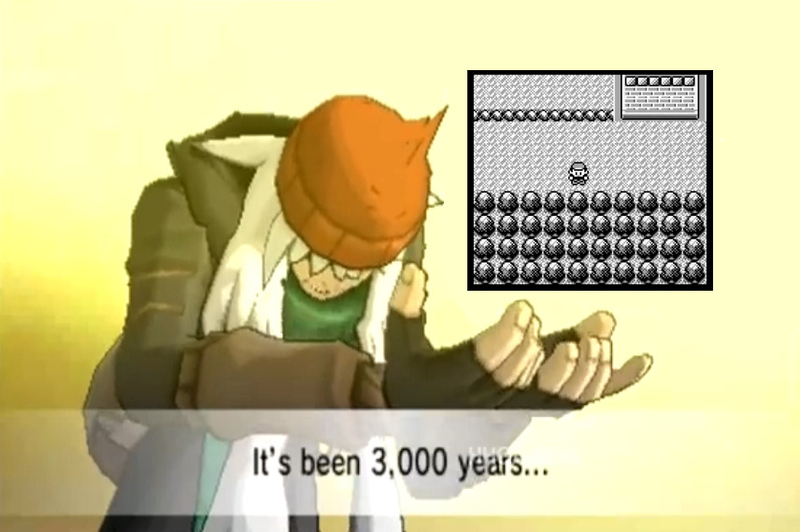 ALL PRAISE THE HELIX FOSSIL! This is the strangest idea i've ever seen. 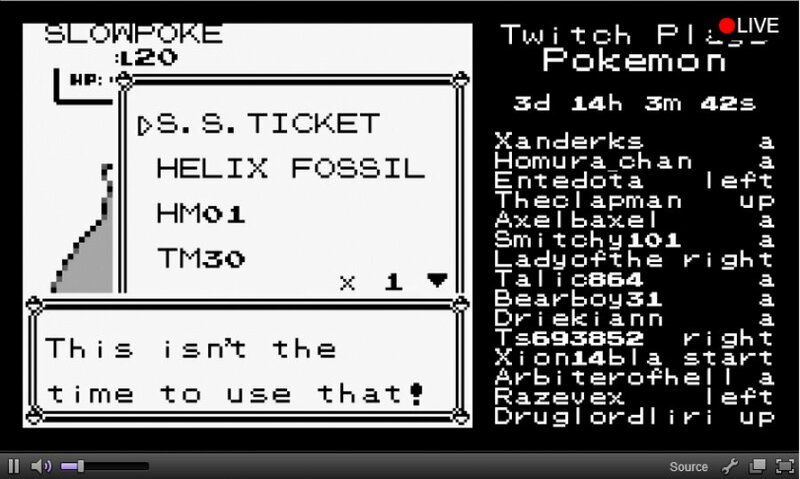 Someone else is doing a Twitch Plays Pokémon Emerald and another guy's doing a Twitch Plays Pokémon Crystal. The trend is spreading! Would love to put people through the Water Temple in Ocarina of Time. I just successfully stopped watching this before my brain melted. I will try to forget what I saw. I was actually watching this myself. It is impossible to input commands because too many people are still talking. Bahaha why haven't I seen this until now? It's hilarious! I highly doubt they will ever get passed the Rocket Hideout maze but it's still funny to watch. This idea is freakin' genius! @AdanVC LMAO "consult the helix!" Oh they've added a democracy system where everyone votes on a button input instead. Things seem to be going better for them now lol. Hmm.... i thought there were already emulators that you could vs people online. then again I could easily be wrong. They should make em with a friends list sort of thing otherwise. Now, this is a cool concept, but it needs to go away. It's causing so many Twitch problems with streaming, chat etc... and it needs to go somewhere else. Twitch claims to have this on a dedicated server, but it's not helping anything. I started up my Twitch channel recently... and yeah, it's super annoying. 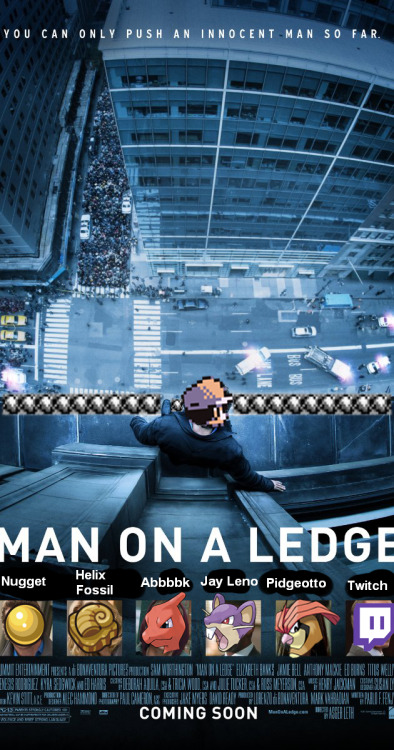 TwitchPlaysPokemon, please die. Another awesome Idea for online play for 3ds or Wii-U which Nintendo will just ignore. Huh? Online play, our gamers don't need that.